Want to know how you’re doing online … what to do better … and how to do it? 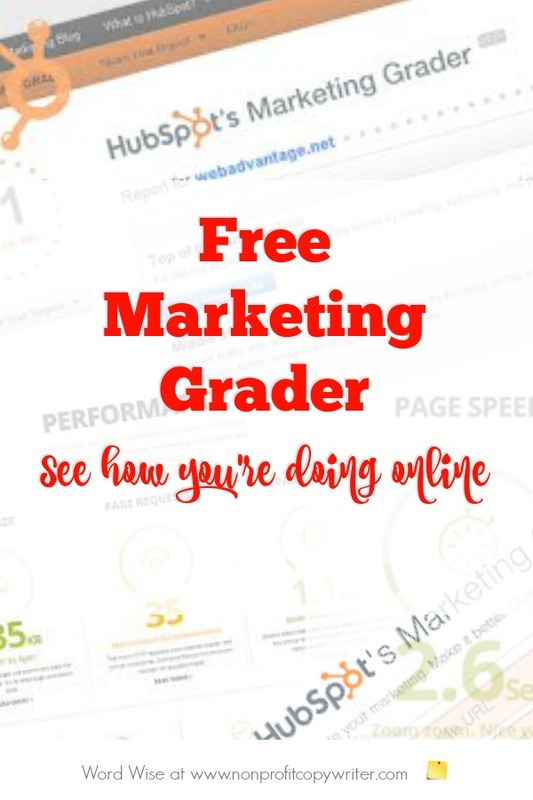 Marketing Grader is a free tool that analyzes your online marketing efforts – your website, blog, social media sites. But it’s not just a print out of numbers. The report lets you know where you're succeeding, what you need to spend more time improving, and gives you action steps to do so. When you go to the Grader’s site, you’ll see a box in which to type in your website address. Do so. Thirty seconds later, a report about your online marketing efforts pops up on your screen. Lead Generation: Are my marketing efforts generating enough leads? Overall Analysis: What are the strong points and shortcomings in our communications? What’s especially helpful about the tool is that it doesn’t simply point out where you’re succeeding or not. The report explains what each element does to generate more reader interest on the web. This is helpful because it allows you know where to invest your time and resources first. You’re not just left hanging. Links, help videos, and resource nuggets lead you to resources to help you fix or improve each area of your online marketing mix. Are you using your time well online? How can your copywriting be more effective? Where should you invest your writing and marketing to get more exposure on the web? If you’ve ever asked those questions, hop on over to the Grader and get started finding some answers. If you’ve never asked those questions, you can. And it won’t cost you a thing to get some answers.